The customer is KING and your relationship with them is important to drive your business growth, prosperity and success. As you grow, your customers grow as well. Hence, a well -designed CRM (Customer Relationship Management) system is very important for any entrepreneur to manage things well. Data states that 91% of businesses with more than 11 employees use CRM software. 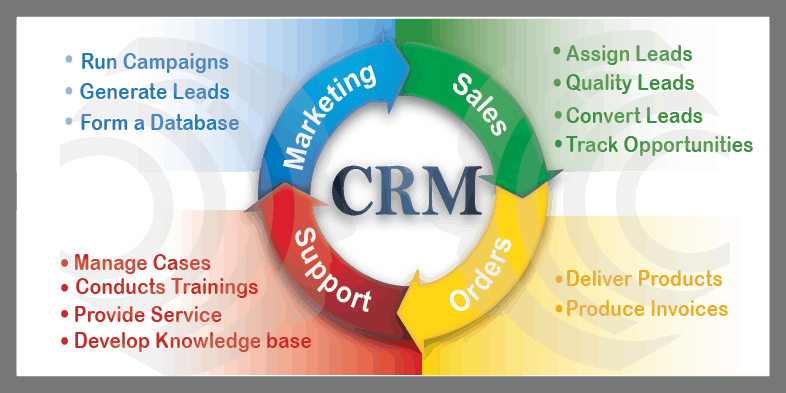 A successful CRM implementation has various aspects to it which we will discuss in detail here. Customer Relationship Management (CRM) is a strategy or a combination of practices, strategies, and technologies for managing the company’s relationships and interactions with customers and potential customers. It helps you improve your profitability. You can read about how an easy-to-use CRM system can be beneficial for small businesses. 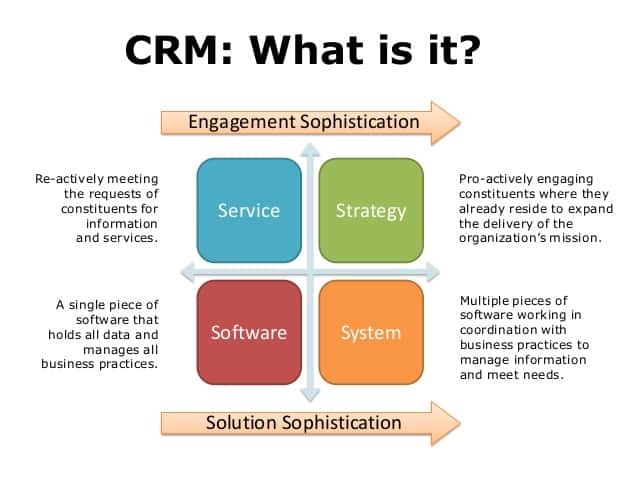 Let us quickly take a look at the various elements of a CRM system. Earlier, CRM was mostly used to store customer data, but it has changed over the years. Now, CRM is an end-to-end software where storage is not the only thing it does. Contact Management (94%) still remains at the top as the purpose of a CRM system closely followed by lead nurturing (65%) and email marketing and sales forecasting at 59%. Human Resource Management: It is the effective management and usage of human resource and skills in different situations across the Organization. This is an important component for any organization as employees are their most crucial asset. It helps in adopting an effective people strategy and analyzing their skills to develop and implement strategies for growth and development. Customer Service: This section collects customer information and data, their purchase patterns as well as shares relevant data with concerned departments. This helps them to take steps to develop their awareness and understanding of the customer needs as well as complaints. SalesForce Automation: It is an essential component which includes forecasting, recording sales processing, and tracking potential interactions. It brings out the revenue generation opportunities and helps to analyze the sales forecasts and the performances by the workforce. Lead Management: This is to keep a track of the sales leads and their distribution. This is widely used in sales industries, marketing firms and customer executive centers. This process encompasses everything from efficient management of campaigns to designing customized forms to finalizing the mailing lists and other things. It also studies the customer purchase patterns to determine potential sales leads. Marketing: CRM assists in the marketing process by enhancing the effectiveness of the strategies used for marketing and promotion. There are various sub-elements like List Management, Campaign Management, Activity Management, Document Management, Call Management, Mass Emails, etc. Workflow Automation: CRM helps to automate and streamline different processes and improve overall efficiency. It not only reduces the excess expenditure but also prevents the repetition of tasks. Reducing paperwork and redundancy is one of the major purposes of a CRM system. Analytics: Analytics is analyzing and presenting collected data so that important learning can be derived and decisions made. Creating graphical representations of the data in the form of histograms, charts, figures and diagrams from the current data as well as past trends is very important. Analytics provides the necessary information for business growth and prosperity. Reporting: A CRM system is responsible for providing different reports on the business. It should have the flexibility to create different types of reports which are accurate and precise. It helps in forecasting and the ability to export the business reports on other systems is a major requirement for any CRM system. Better Organization: Information becomes more organized, manageable and readily available for different departments. This also helps to streamline processes and cater to customer service in a better way. Improved Communication: Centralized data facilitates better communication. Be it an external customer or internal stakeholders, the information can be shared more smoothly and in a transparent way. This also leads to improves efficiency between multiple teams and gives them access to the right information at the right time. Automation: CRM is a combination of various processes guided by technology and industry norms. It helps in data collection, dissipation, and analysis of information which can be further used for decision making and improvements. Automation of everyday tasks also helps to get rid of redundancy and increases efficiency. Enhanced Customer Service: Since CRM is a reliable repository of customer information, it is easy to pull out their data whenever they contact a company representative. Customer information, past sales data, purchase patterns, etc. – all these can help in better customer service and engagement and hence enhanced customer satisfaction. Better Analytics: With various integrated tools and plugins, it becomes easy to analyze the data and present in a way that is helpful in making reports at various levels. The automatic reports, personalized dashboards, and other tools help to measure and improve performance and give detailed insights. The average ROI for CRM is $8.71 for every dollar spent. 47% of CRM users said that their CRM had a significant impact on customer retention and customer satisfaction. 74% of businesses improve customer relationships with CRM. 82% of top salespeople cite CRM tools as “critical” to their ability to close deals. CRM Implementation requires a complete assessment of your needs, budget, and ROI that you are expecting. And, most importantly, CRM Implementation needs support from everyone. What are the goals or benefits you expect after CRM Implementation? What resources will a CRM implementation involve? What organizational changes you might plan for? We will discuss some of the major factors which impact CRM Implementation for any Organization. Executive Support: A CRM system will only be effective if people in the Organization use it diligently. That is why executive support is very important. CRM is for everyone in the Organization with various degree of privileges. So, involvement is required at every level. Since the top management drives the opinions and culture in the Organization, their support definitely sends a positive ripple. Proper Planning: As mentioned earlier, a detailed plan needs to be formulated which reflects the Company values, mission, and vision. You must account for each and every aspect in the plan including a contingency plan. During the planning stage, you need to identify stakeholders and collect information about your exact requirements. Then, you need to create a prioritized list of initiatives and their corresponding actions to determine the implications and the project timeline. Technology Choices: The right technology is very important for any CRM Implementation. Evaluating your current status and assessing the compatibility of the new system are basic groundwork that needs to be done. Right CRM Implementation: Once you have chosen the CRM system that you want to opt for and the one which suits your business the best, the next step is the actual implementation. 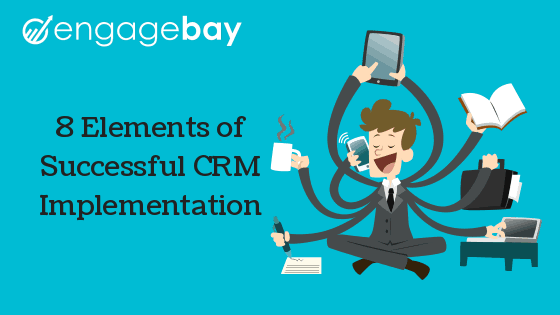 CRM Implementation involves a lot of changes so you can think about executing in phases so that you can manage one thing at a time and then integrate. Often migration from your current state to an automated one becomes tedious, but you need to plan ahead. A dedicated and specialized team can be pre-trained to handle things better. You can announce the launch with a bang so that everyone feels excited about it. Extensive Training: After CRM Implementation, the first thing is educating your workforce about it and training them to use it. It is not just to teach them how to use the system but also to urge them to set best practices. If you have opted for a specific vendor, you can organize for specialized training sessions for different levels. Both theoretical and practical aspects need to be explained through training. Ensure you assign a good project manager who can handle the end-to-end process. The sales reps need to understand the system thoroughly and get motivated to use it. Make sure there are proper training manuals which can help them later. Inter-Departmental Integration: From a strategic perspective, CRM implementation has an organization-wide influence. Different functions and departments need to be integrated and connected to support a smooth, streamlined flow of information. They need to accept the system such that everyone gets the right information. Customer Involvement: Direct and indirect Involvement of customers in CRM Implementation can strengthen the system. 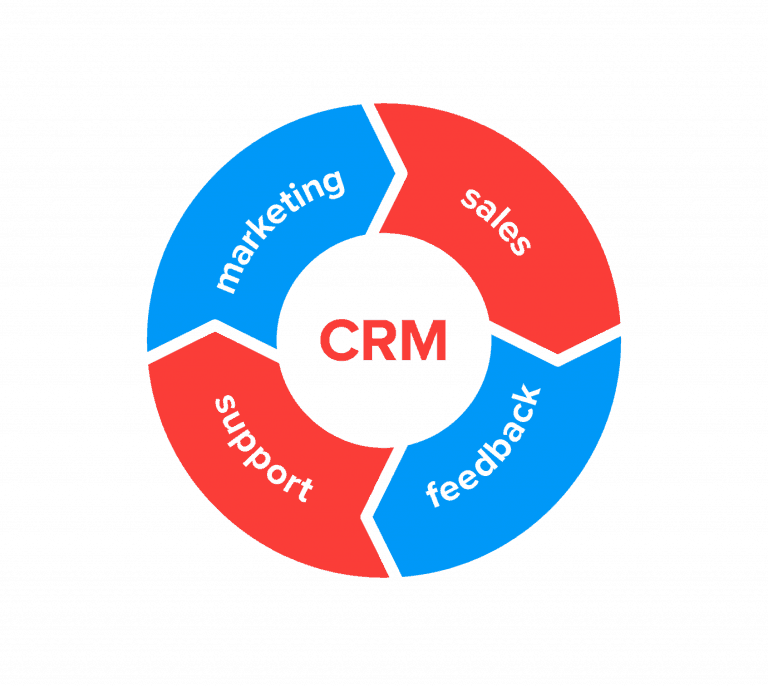 This will help the organization to ana­lyze the customer relationship life cycle and consequently find the areas of problems that can be managed by CRM. Setting guidelines and CRM strategy: Finally, you need to inculcate a CRM philosophy. The internal usage guidelines need to be laid down. People can be the main factor for both the success and failure of a CRM Implementation. A CRM system helps you to develop and maintain a strong relationship with customers. Basically, it helps you to build a customer-centered business model. When it comes to business management solutions, Zoho is one of the best. It includes everything from accounting tools to collaborative apps. It is one of the best Cloud CRM that you can opt for. 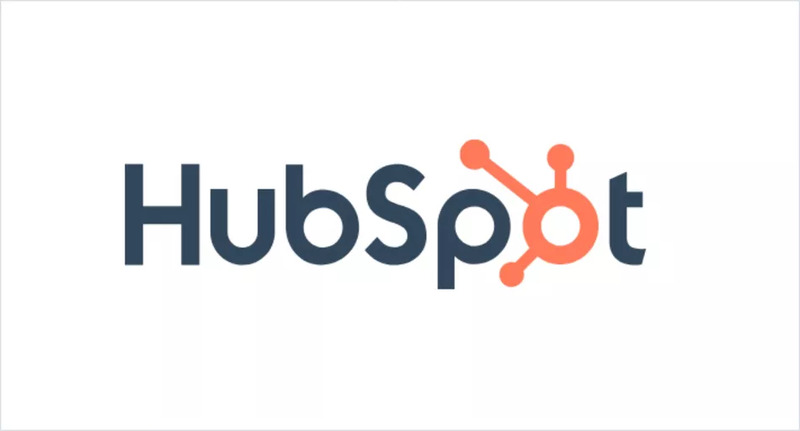 In terms of scalability, HubSpot can be your best option which can handle any increased influx of customer interactions. When your sales department is handling customer interaction and you need to empower them, opt for a sales-oriented CRM system PipeDrive. If you want the best CRM for your small business and budget is not a constraint, SalesForce is the perfect choice for you. By the end of 2018, Customer Relationship Management (CRM) software revenues overtook database management systems to become the largest of all software markets. 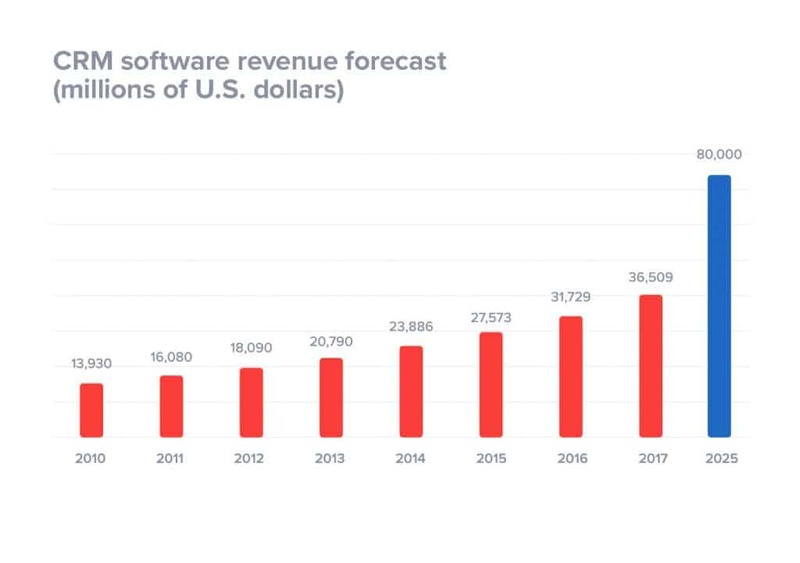 The revenue is expected to reach over $80 billion by 2025, which will definitely make CRM the fasted growing software markets. We will briefly discuss the 4 major trends of CRM that will be prominent in 2019. IoT in CRM for proactive customer service: Internet of Things (IoT) is the big thing that is taking over almost all the industries today. In 2008, only 12% of businesses used cloud-based CRM which has now increased to 87%. IoT in CRM will give it better capabilities in terms of organizations, driving sales, and improving customer service and satisfaction. Such integration might have the ability to analyze information from connected devices and fix issues remotely. It has been found that by 2020, about 12.86 billion installed bases of IoT will be in use in the consumer segment. Increase of mobile CRM: Data says that the use of mobile CRM increases the productivity of employees by 15%. With more than 91% of companies with 10 or more employees using a CRM system, it is important that it is accessible to the requisite people over various devices and platforms. 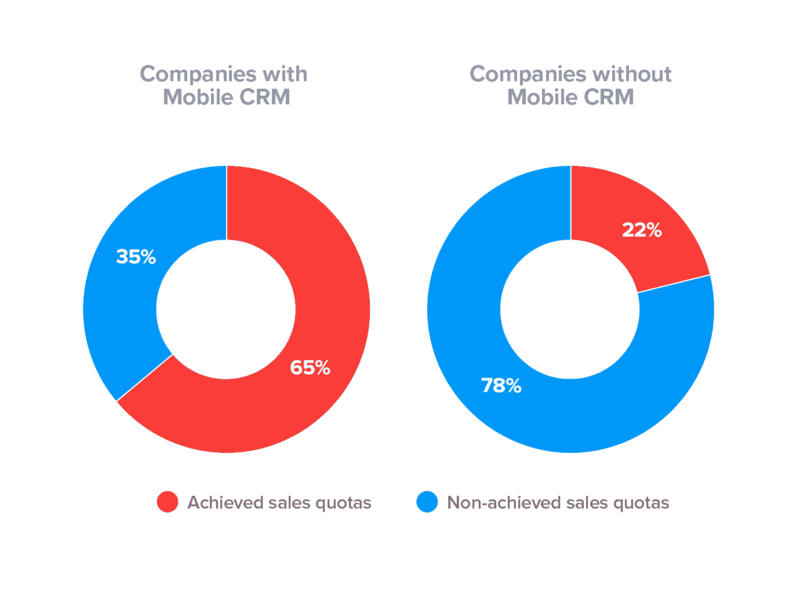 Mobile CRM adds the element of dynamic access and it will be a great advantage for sales reps in the field. It has been seen that 48% of users access CRM through their smartphones and 45% access through their tablets. AI-powered CRM: It is estimated that by 2021, an additional $394 Billion in revenue will be gained from AI adoption in CRM activities, alone in the United States. AI integrated CRM will be the trend in 2019. Over text and facial recognition, voice recognition will be prevalent. This will enable people to access CRM information using voice commands from any device, anytime, anywhere. 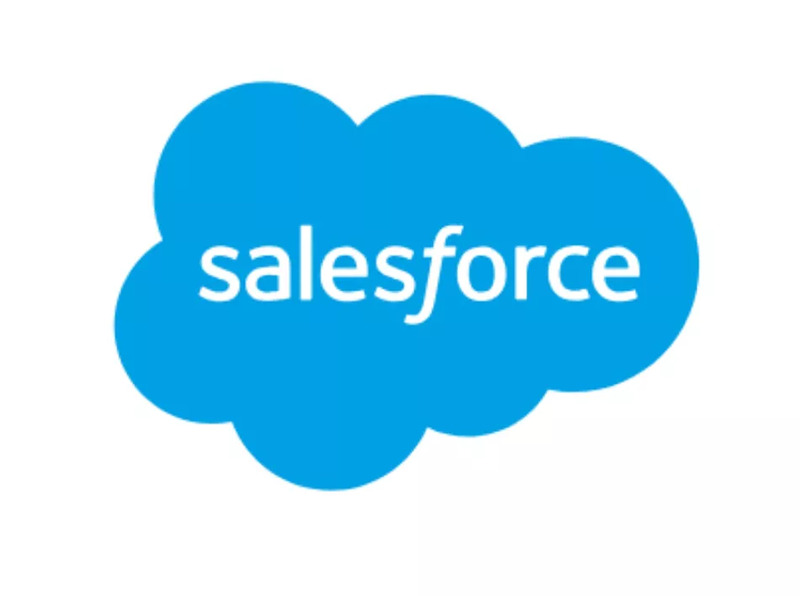 For example, Salesforce’s Einstein enables organizations to access simple to complex information using voice commands. Hyper- individualization: According to a study, by 2020, customer experience will become the key brand differentiator over the price of the product. So, companies are looking for ways to provide customers an enriched and hyper-individualized experience. Hyper-individualization is an experience of delivering service to customers which makes them feel valued and appreciated because you understand their needs and requirements. A report by Accenture states that around 75% of consumers are more likely to buy from a retailer if they are recognized, are offered relevant recommendations and remember their purchase history. CRM Implementation needs detailed planning and execution based on company requirements, market research and individual needs. The budget is also one of the major factors that affect CRM Implementation. The social CRM market is expected to reach 10 billion in 2019. So, if you have already deployed a CRM system, make sure you use optimally. And, if you ate planning to put a new CRM system in place, consider the above CRM implementation guidelines in mind and implement a system that will be a boon for your business rather than a burden. For more informative and interesting content of digital marketing and other social media trends, visit our blog. For a better insight on different services provided by us, take a quick look at our Resources.